This tutorial is base on stone size 3.0 x1.8 cm. 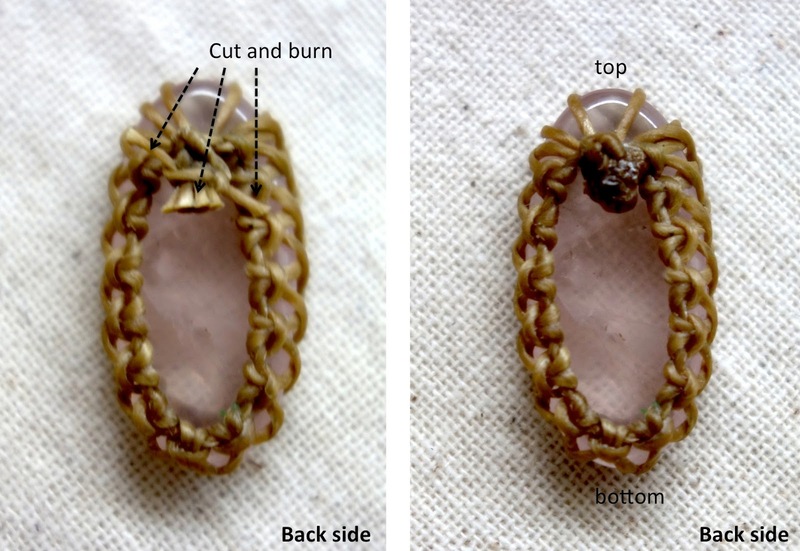 If you have bigger or smaller stone, the pattern will not be the same, you can add or reduce some cords as in instructions. 1. Oval shape stone, size 3.0 x1.8 cm. 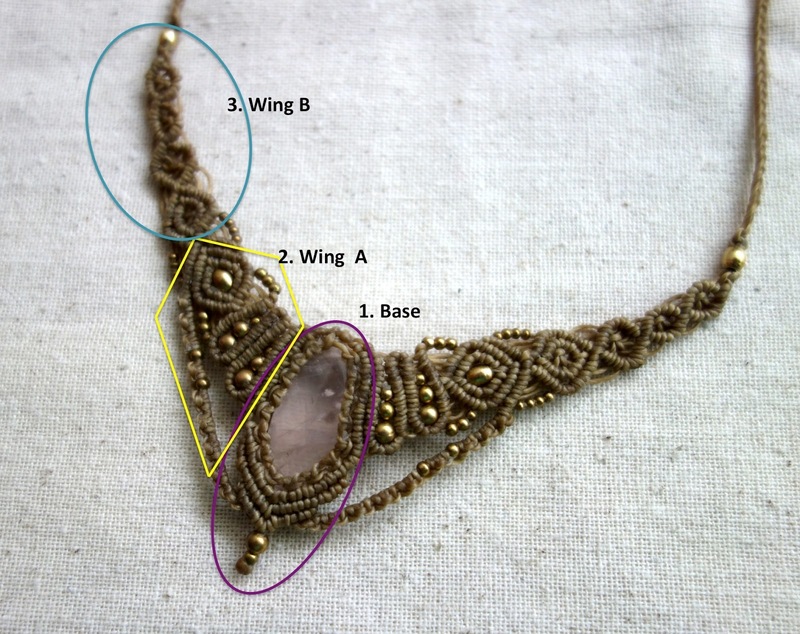 For stone wrapping = around 3.0 m.
There are 3 sections for making this necklace. There will be 8 cords at the end, flip the stone to the back side, bring 6 cords into the holding cord as in the picture. 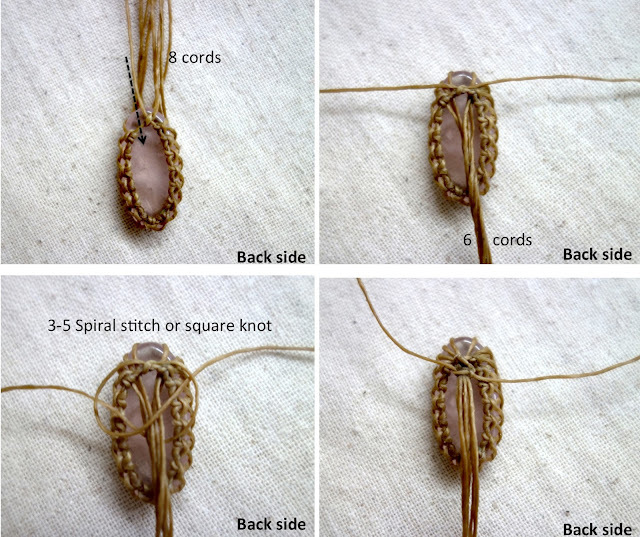 Then use left and right cord tying 3-5 spiral stitch or square knot to secure the end. Cut and burn all the cords. On the bottom of the stone, thread 6 cords--60 cm. 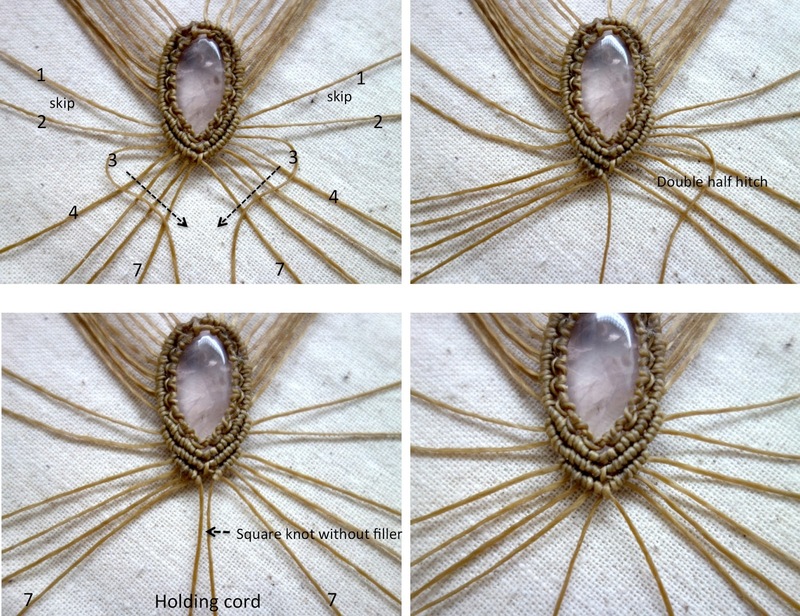 (more or less depend on your stone size) into the lace around stone, you will now get 12 cords , 30 cm. long each. 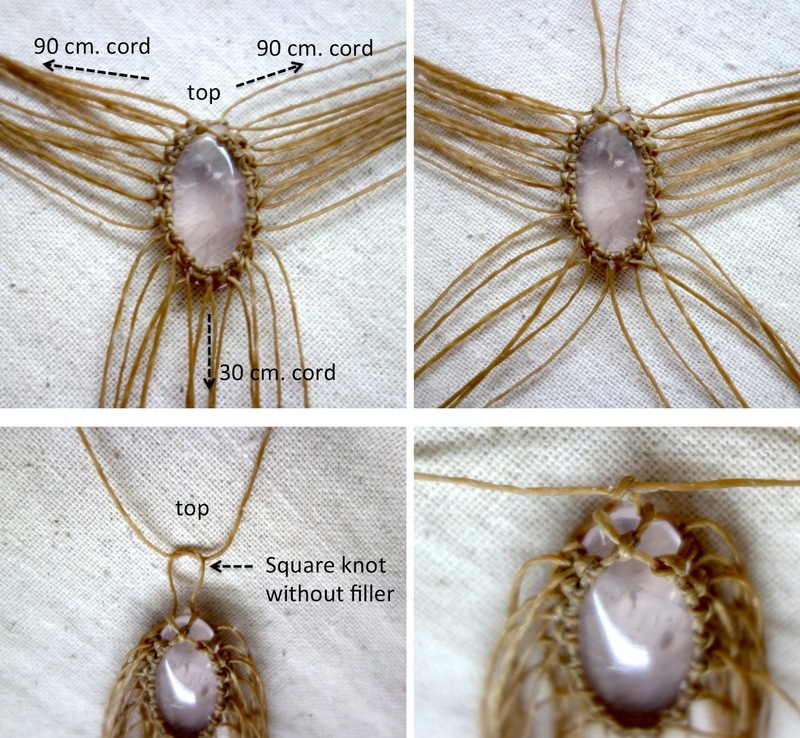 Thread the same method with the Top Right of the stone. 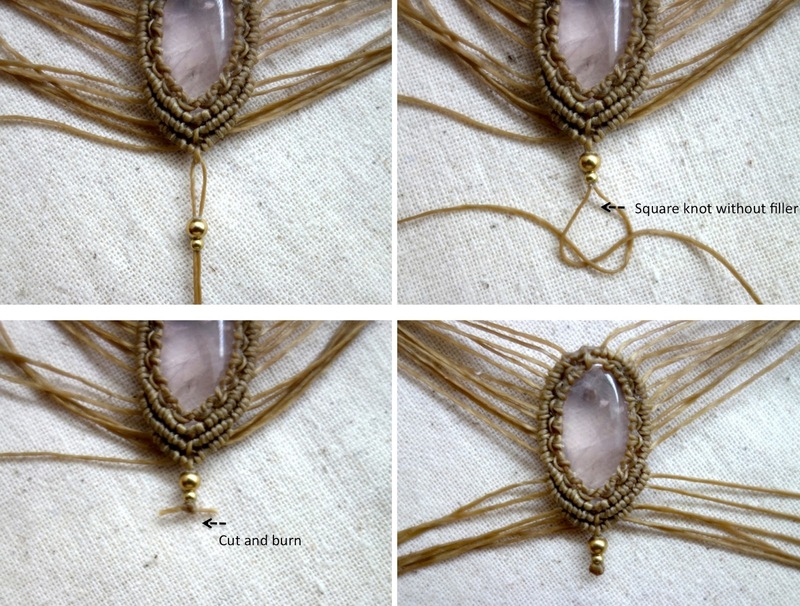 Use 2 middle cords at the top of the stone, tie 1 Square knot without filler. We will use this 2 cords as a holding cord for next step. 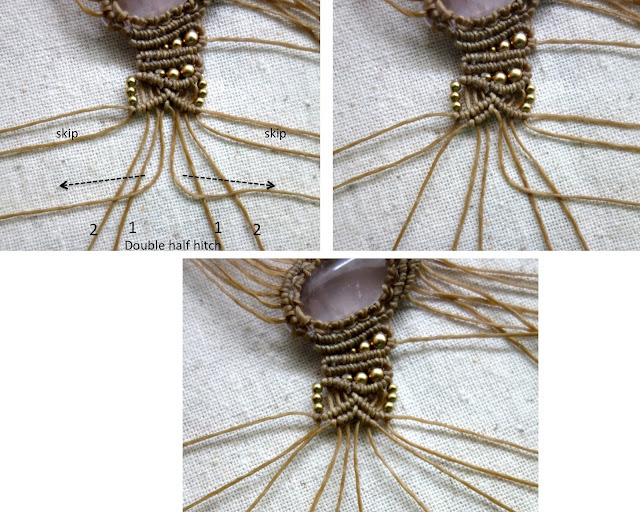 At the top of stone, use middle cord as a holding cords, tie double half hitch bar form 1 -17 cord. 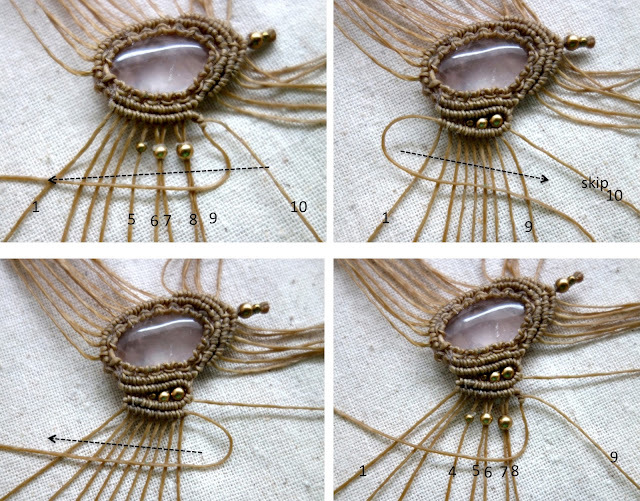 Start with 1st cord on left and right side first, then follow on each side 1-17. 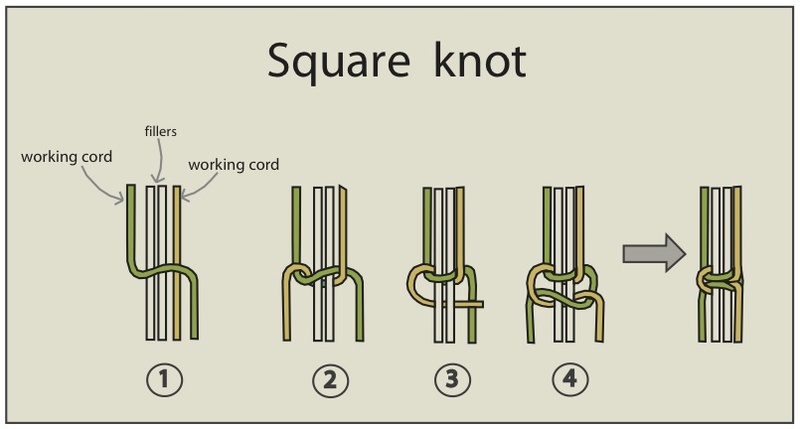 At the end, tie 2 holding cord with 1 Square knot without filler. 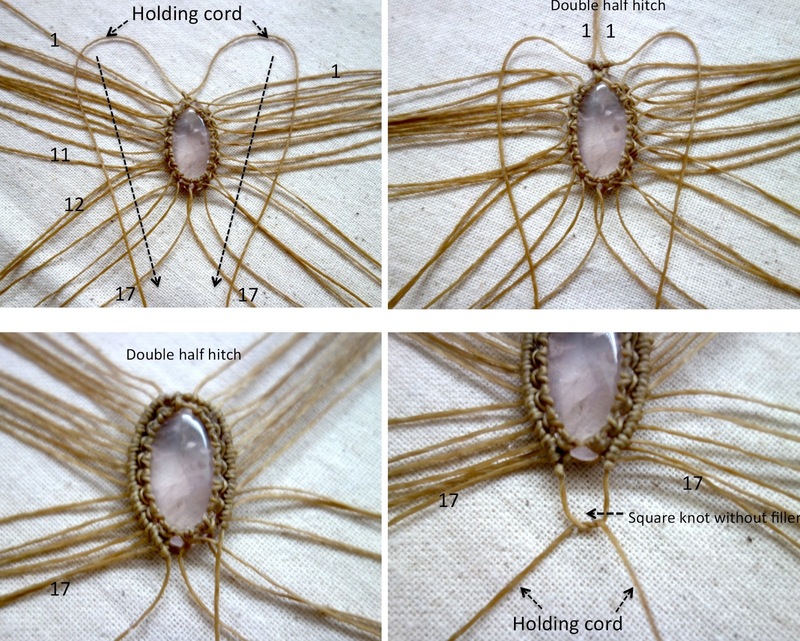 Now 2 holding cords on the left and right side are in the middle, tie them in the square knot without filler. Skip 1& 2 cords right and left side of your work. At the end tie 2 holding cords with 1 Square knot without filler. 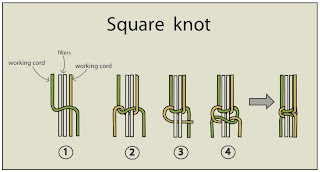 Then tie 1 square knot without filler to secure the end. Cut and burn the cord to finish. There are 11 long cord 90 cm. on each side. Use the most left cord as a holding cord, tie double half hitch bar (to the right) form 1-10 cord. Turn the holding cord to the left. 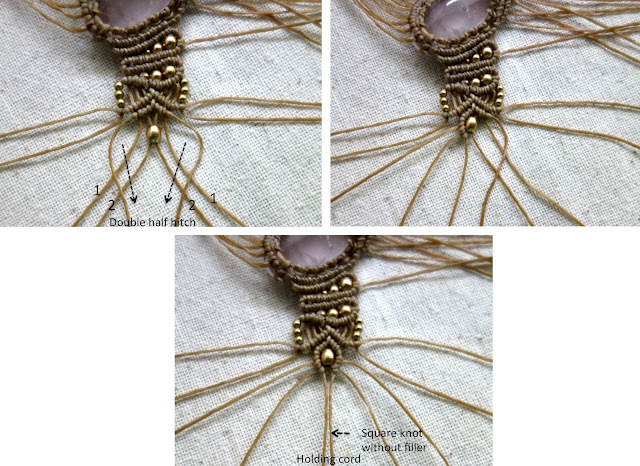 Thread beads into the working cord before tying // 4.0 mm. into 8, 9 cord // 3.2 mm. into 6, 7 cord //2.4 mm into 5 cord. Tie double half hitch bar (to the left) form 10-1 cord. Turn the holding cord to the left. 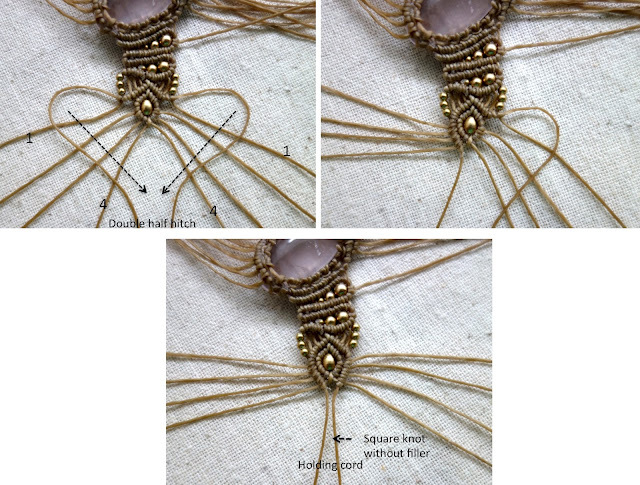 Thread beads into the working cord before tying // 4.0 mm. into 7, 8 cord // 3.2 mm. into 5, 6 cord //2.4 mm into 4 cord. Then tie double half hitch bar (to the left) form 9-1 cord. 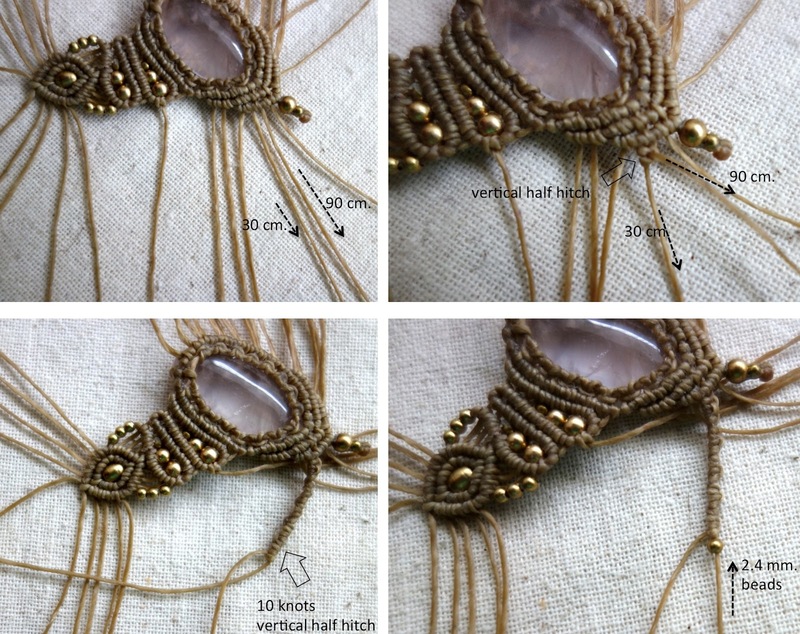 Thread 3 beads (2.4 mm. ) on the most left and right cord. Tie 1 Square knot without filler with 2 middle cords, Then use this 2 cords as holding cord. 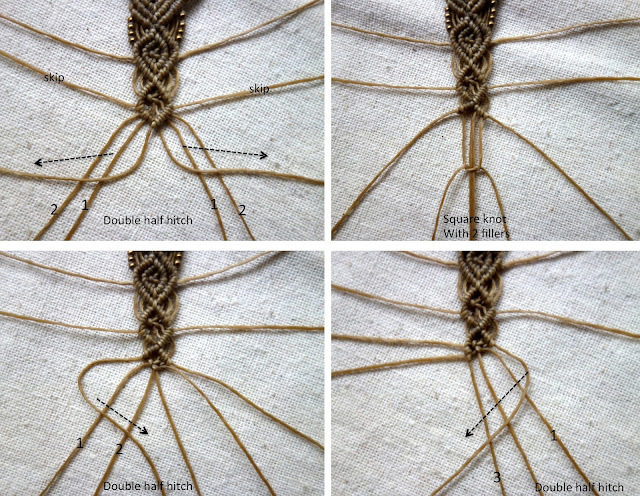 On the left side, Tie double half hitch bar (to the left) form 1-4 cord. 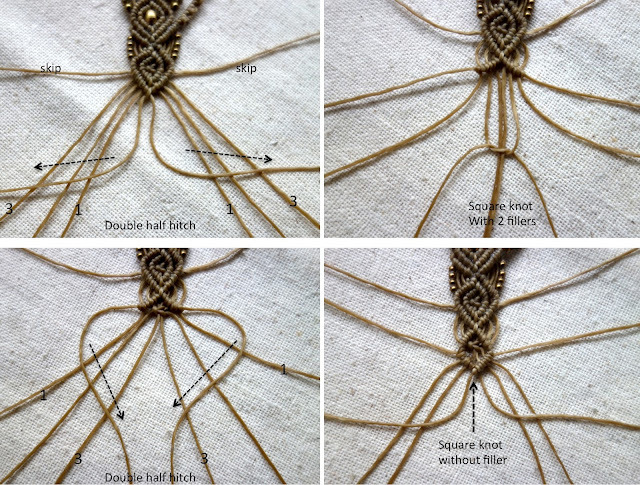 Then tying the same method with the right side. 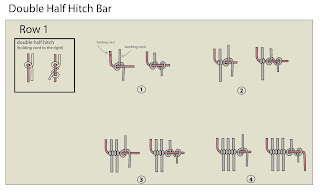 On the left side, Tie double half hitch bar (to the left) form 1-2 cord. 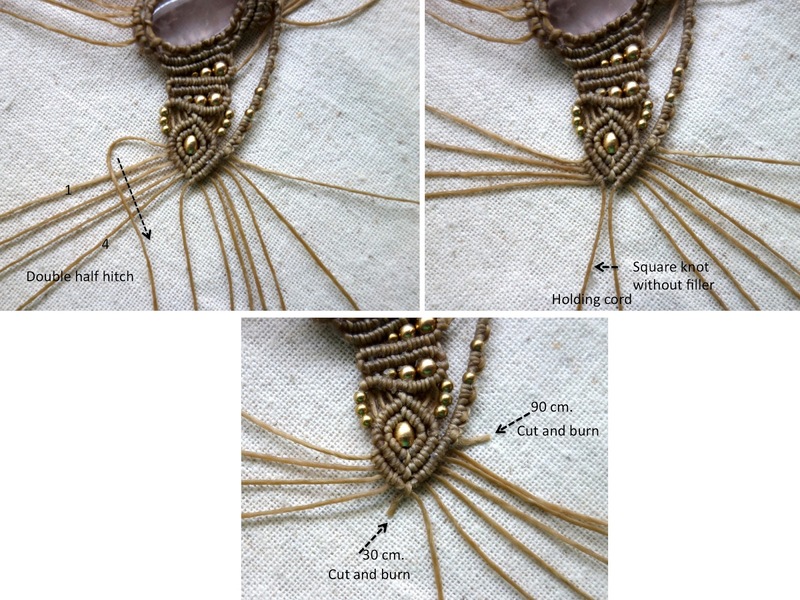 Then tying the same method with the right side. Thread 1 oval bead into 2 middle cords. 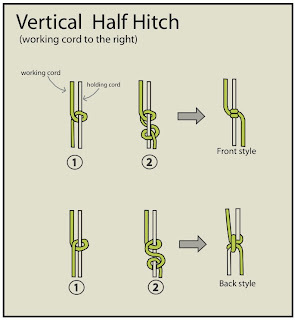 Use the last holding cord, On the left side, Tie double half hitch bar (to the right) form 1-2 cord. Then tying the same method with the right side. Use the most left and right cord as holding cord. 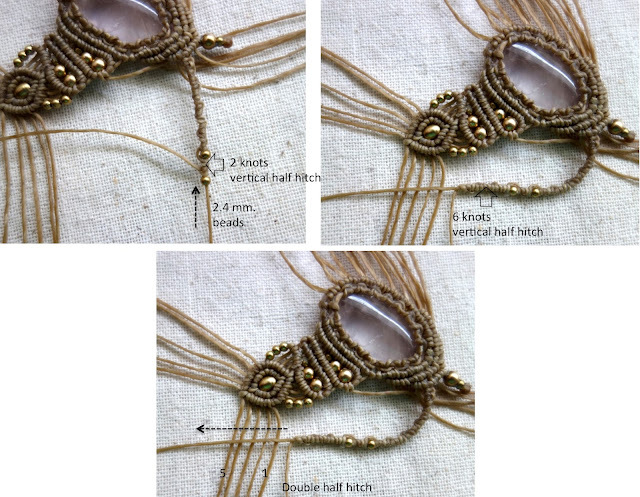 On the left side, Tie double half hitch bar (to the right) form 1-4 cord. 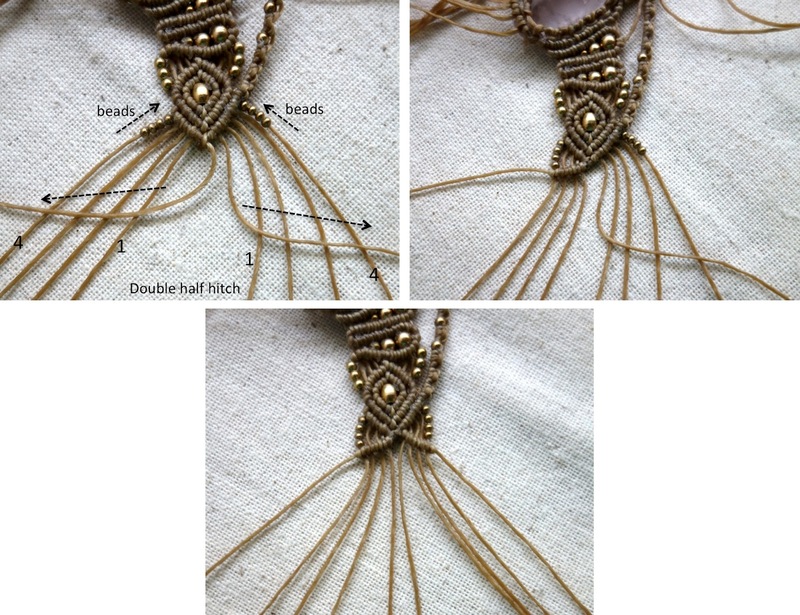 Then tying the same method with the right side. Go to the bottom side of the stone. You fill find 1 long cord 90 cm. near the middle of bottom side, and short cord 30cm next to the left as in the picture. Use these 2 cords next. 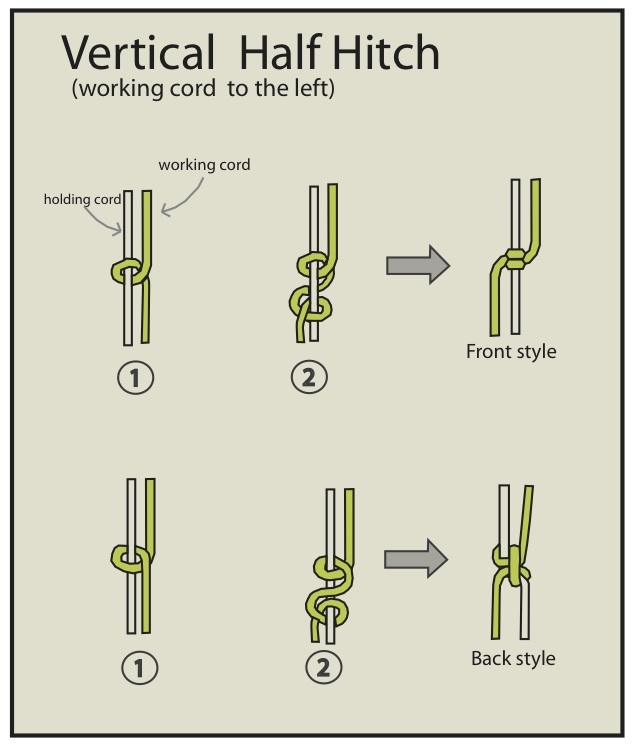 Tie vertical half hitch to the left (1 knot), long cord will be working cord, short cord will be holding cord. 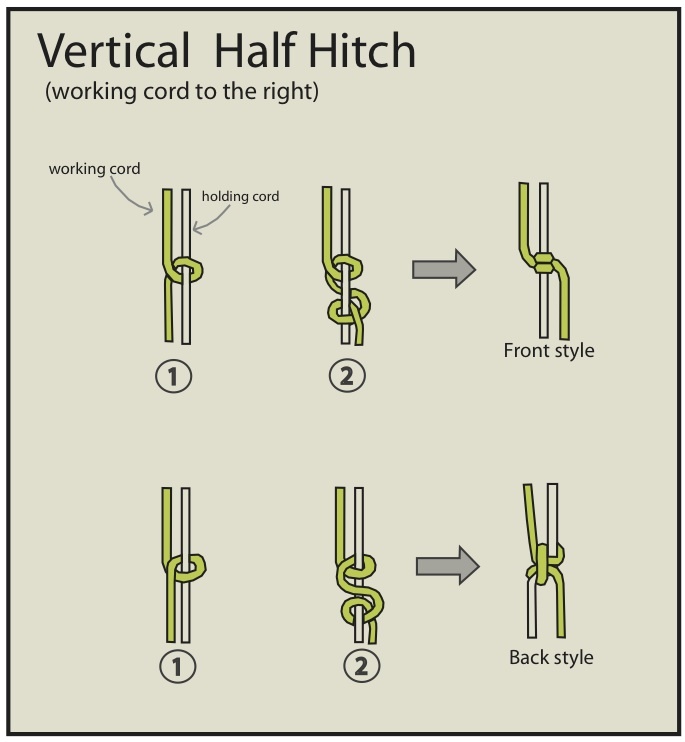 Then tie vertical half hitch to the right. 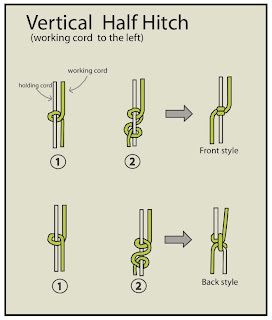 You will get 1 thick line of vertical half hitch. Thread 2.4 mm. 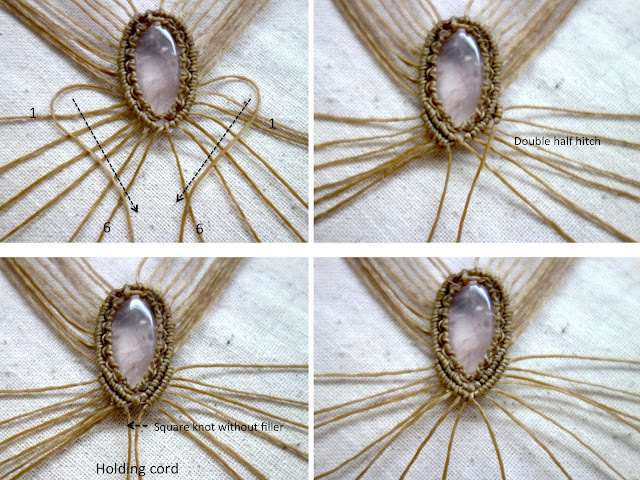 bead into holding cord. Use the most left cord as a holding cord. Tie double half hitch bar (to the right) form 1-4 cord. At the end tie 2 middle cords with 1 Square knot without filler. 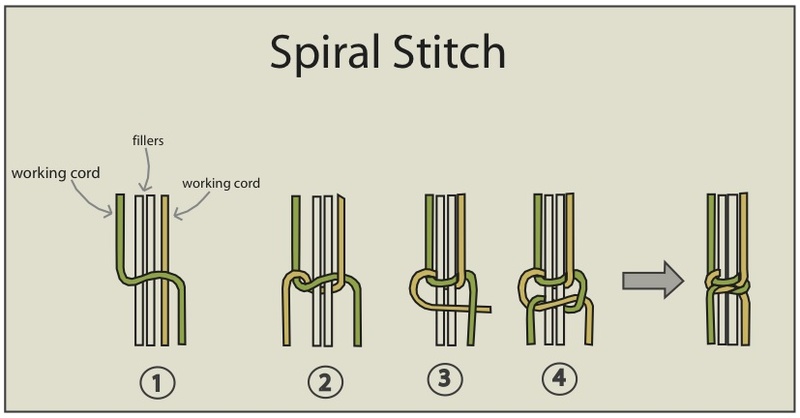 Cut and burn 2 cords , the short cord at the middle and the most right cord(long cord) as in the picture. Thread 4 beads (2.0 mm. ) on the most left and right cord. Use 2 middle cords as a holding cord. 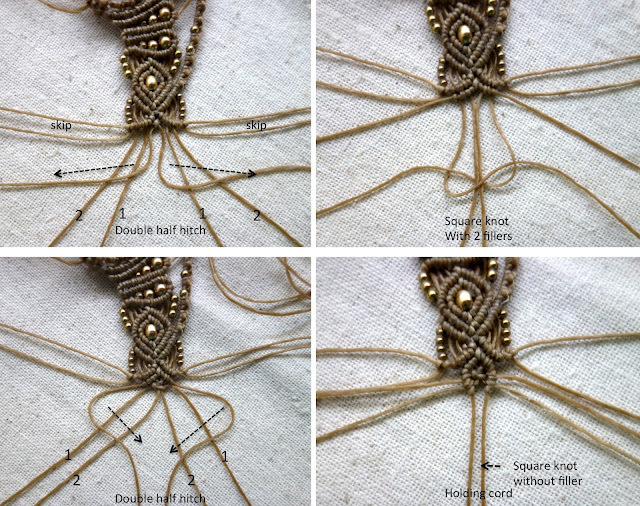 There will be 4 cords at the middle, tie them 1 square knot with 2 fillers. 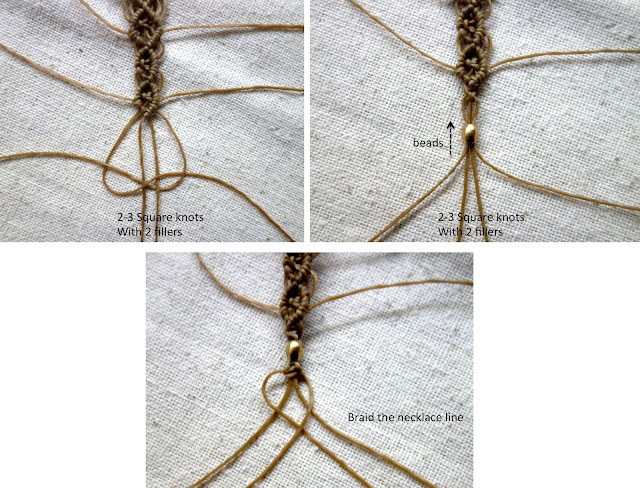 Then use same holding cord, On the left side, Tie double half hitch bar (to the right) form 1-2 cord. Then tying the same method with the right side. Skip the most right and left cords. 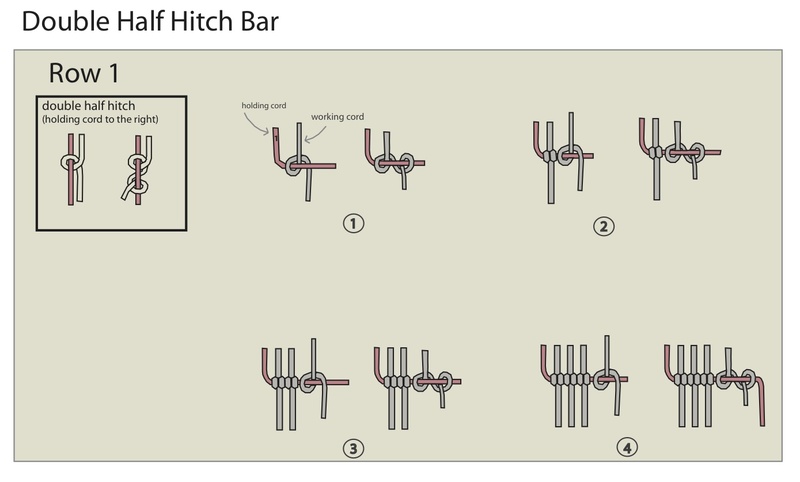 On the left side, Tie double half hitch bar (to the left) form 1-3 cord. Then tying the same method with the right side. Then use same holding cord, On the left side, Tie double half hitch bar (to the right) form 1-3 cord. Then tying the same method with the right side. Skip the most right and left cord. There will be 4 cords at the middle, tie them 2-3 Spiral stitch or Square knot with 2 fillers. Thread 4.0 mm. beads into 4 cords. 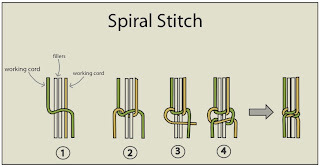 Then tie 2-3 Spiral stitch or Square knot with 2 fillers to secure the end. 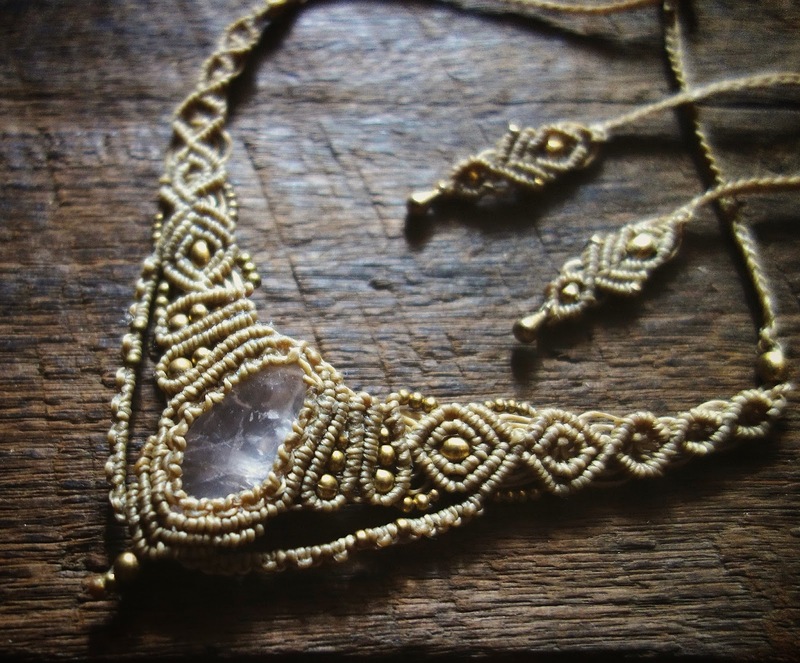 Braid the 4 cords to make the line longer for a necklace. When everything finish, cut all left over cords and burn them, keep the burning spot at the end. 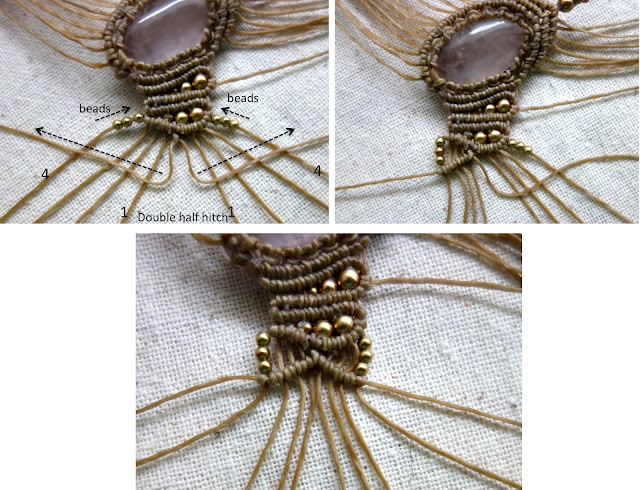 could you also please make a tutorial for how to nicely finish the ends of the necklace with a small bead and some knots, like you have on the ends of this necklace? I would also greatly appreciate this!! I would really appreciate that as well!! You made a really great tutorial! It's the best tutorial that I could find on the internet! 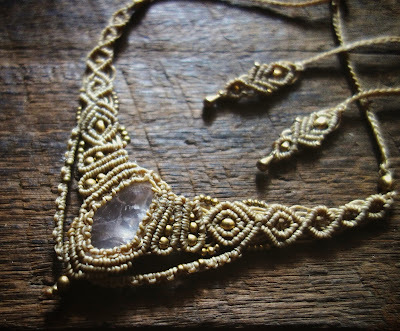 I just started with macrame and thats my first necklace and it worked well, just because of your really good tutorial! Fantastic tutorial! I had some issues with symmetry (basically the two wings in line with the stone but at slightly different angles) asell as getting the little dangly part to hang straight, any advice? Appreciate this tutorial so much! You made a really great tutorial! It's the best tutorial that I could find on the internet!